Every child who visits a Shooting Star hospice has their own unique needs. Many people who support like to make a donation of an item that will really make a difference. This could be a Christmas present or Easter gift for a supported child. It could also be items that will help a family going through an incredibly difficult time. Shooting Star also need items to help care staff in their jobs at the hospices, or with the hospice at home team. Browse the Amazon Wish List to see what is currently in need. 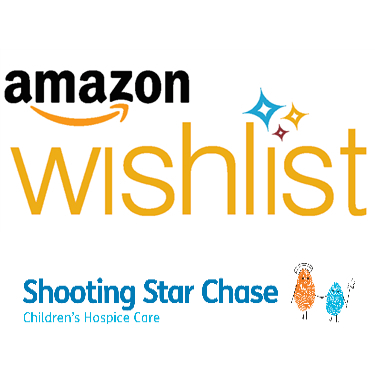 If you would like to support Shooting Star by buying something tangible to use at one of the hospices they have set up an Amazon Wish List. This features a wide selection of items needed both by the children and families they support, and the care staff at the hospices. It is regularly reviewed and updated by the care staff. By buying something off this list you can be sure you are providing something that will really make a difference. Shooting Star is also registered as an Amazon affiliate. This means that if you click on the link to the gift list on this page and then buy an item, Amazon will pay a small percentage of the item price direct to Shooting Star Chase. Plus if you buy through Amazon Smile they will also make an additional donation for every item sold. Neither option costs you a penny extra, and your gift will also go to helping fund Shooting Star services. Your support is truly appreciated so if you purchase something on the Amazon Wish List please do email info@shootingstarchase.org.uk so we can thank you!